ISG15 is expressed in its pro-form with a short C-terminal extension, which is processed to expose the C-terminal glycine residue that is essential for conjugation to target proteins. Source: Produced in E. coli. Human pro-ISG15 is fused at the N-terminus to a His-tag. Formulation: Liquid. In 20mM HEPES, pH 8.0, containing 50mM sodium chloride and 1mM DTT. 1. Study of ISG15 regulation and processing. 2. Substrate for deISGylating enzymes (C-terminal hydrolase activity). Scientific Background: ISG15 is an interferon (IFN)-α/β-induced ubiquitin-like protein, also known as ubiquitin cross-reactive protein (UCRP), that is conjugated to cellular proteins during innate immune responses to bacterial and viral infections, including HIV. Although the biochemical consequences of ISG15 conjugation and the fate of the conjugated proteins are not currently known, it does not appear that ISG15 targets proteins for proteasomal degradation. ISG15 contains two ubiquitin homology domains in tandem and shows ~30% identity to ubiquitin. ISG15 is synthesized as a 17kDa pro-form (-GTEPGGRS C-terminal extension), which is subsequently cleaved to expose di-glycine residues at the carboxyl terminus, essential for subsequent conjugation to target proteins. Conjugation of ISG15 to cellular proteins occurs in a parallel but distinct mechanism to that of ubiquitin. The E1 activating enzyme for ISG15, is a single-subunit, ATP dependent enzyme, also known as Ube1L, while UbcH8, a member of the ubiquitin E2-conjugating enzyme family, has been identified as a major E2 enzyme for the ISGylation pathway, interacting with Ube1L to facilitate target protein ISGylation. 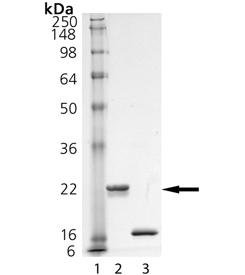 BML-UW9230 is a recombinant protein produced in E. coli corresponding to the human pro-ISG15 sequence (Accession number: P05161) encompassing an N-terminal His6 tag within a leader sequence. SDS-PAGE Analysis. Lane 1: MW Marker, Lane 2: 1 µg pro-ISG15 (Prod. No. BML-UW9230), Lane 3: 1 µg ISG15 (Prod. No. BML-UW9235).